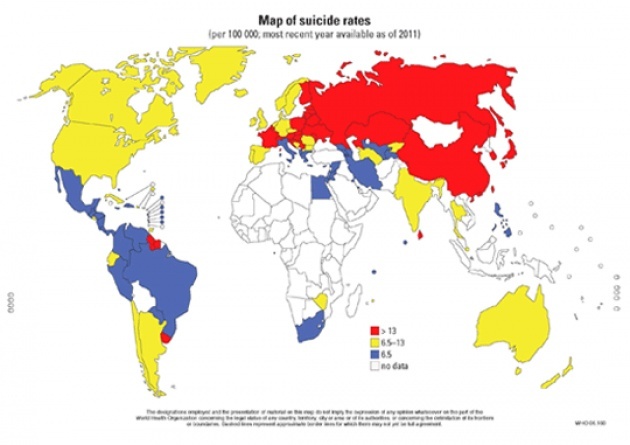 "Suicide causes more deaths every year compared to wars, conflicts and homicides put together," according to Shekhar Saxena, Director of WHO Department of Mental Health and Suicide Abuse: "The figures are very high. Almost one million people every year commit suicide and there are about ten, twenty times that number who attempt it. And the people who attempt it also suffer from serious physical as well as mental consequences. So the problem is huge and the health burden as well as the social burden is very large." See our Film: “World’s Biggest Killers”. Monday (September 10) is World Suicide Prevention Day. The number translates to one suicide every 40 seconds, and that means almost every other second a suicide is attempted. This reflects much pain in those who attempt suicide but also in the circle of family, friends and co-workers. "Generally men complete suicide more often than women, although women attempt suicide more often than men. In terms of age groups, the incidents of completed suicide rises starting from early adulthood to middle aged. However, there is concern about an increasing number of suicides amongst young adults in recent times,” according to Shekhar Saxena. WHO is advising governments, international organizations, NGOs and local communities what measures they can take to try to prevent suicide. Ahead of World Suicide Prevention Day, the World Health Organization has produced a report, called "Public Health Action for the Prevention of Suicide" to help all sectors of society to play a part in combating suicide. Mr. Saxena asserts: "Very often suicide is an impulsive behavior against a background of stress. And if you can avert that moment when a person is ready to take one's own life by reducing the availability of means to commit suicide; that is very often quite helpful."